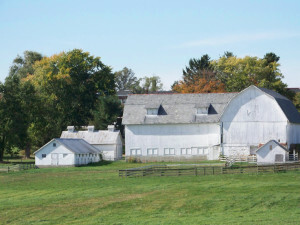 County Home Building – original location beside the large barn before it moved to the WCHS campus. In Ohio’s earliest days, institutions for the care of destitute people were officially known as “poor houses.” In 1816, supervision of the caring of “paupers” became the responsibility of the Wayne County Commissioners. In 1850 the Ohio Legislature enacted a law changing the name from a poor house to a county infirmary and the Wayne County Infirmary was established in 1852. It was conducted under that name until 1919 when the present name “County Home” was enacted. One-room schoolhouse Because dependent children and orphans were placed in the Wayne County Infirmary, they needed access and use of a school. In addition, the children of the Infirmary employees more than likely also went to the same school. The one-room schoolhouse of the Wayne County Infirmary was erected at or about the same time of the Infirmary itself in 1852. The children who were placed in the Infirmary went to school there for thirty years until 1882 when they were then placed in the new Children’s Home. The purpose of a Children’s Home was to “furnish an asylum for indigent children under age 16 where they are to be provided with physical, moral, and mental training.” It was in March of 1882 that the first children were moved from the County Infirmary to the newly completed Children’s Home north of town. Wayne County was especially progressive because in 1884, two years after the establishment of the Wayne County Children’s Home, the State finally required separate institutions for children. The County Home had 288 acres, was a fully functioning farm, and was financially self-sufficient. They grew crops and used teams of horses until the farm gradually became mechanized. One team of horses was still used (until the farm operations were discontinued) for working in the truck patches and cultivating and spraying potatoes. Smokehouse After 1882, the second function of the building was as a smokehouse. When entering the County Home building on the Society campus, one will notice that the inside is completely covered with soot from the smoke. At the time, meat requirements for those living at the county home added up to one beef every six weeks and four hogs per month. In addition, it took 26 chickens for one Sunday dinner, so the building was kept full. In the first quarter of the 1900s, this building was converted to a storage facility for agricultural supplies, seeds and tools. It remained in active use until the farm ceased operations in the 1980s. After farming operations stopped, the building sat vacant for over thirty years. Because of disuse, it was not maintained and began to deteriorate. In addition, high winds in the past twenty years forced the building to lean heavily. In 2012, the County Home gave the building to the Wayne County Historical Society in order for it to be reconstructed as it was built in 1852. In 2013, reconstruction was completed. The inside of the building is completely period to the time and the outside has been restored to resemble a typical building of this era. When visitors enter the County Home building on the Society campus, it is divided into two sections: A 1852-1882 one-room schoolhouse and an agricultural building used from 1882 through the 1980s as a smokehouse and then for horseshoeing and storage of supplies, seeds, and tools. The Wayne County Historical Society is proud to have an outstanding period building from the Wayne County Home dating from the mid-1800s through the 1880s. It depicts the lives of dependent Wayne County children and adults as well as the agricultural life of the County Home from the early days of the County.